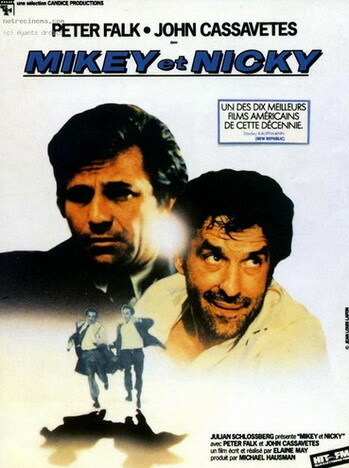 Mikey and Nicky is a 1976 American film written and directed by Elaine May. Originally intended as a summer 1976 release, then moved to Christmas 1976 due to editing problems, Mikey and Nicky was released in New York City on December 21, 1976. May had missed the film's delivery date because of her perfectionism in the editing process. Litigation followed between her and Paramount, with the studio gaining possession of the film with final cut privilege. May didn't direct again for nearly 12 years. The film's original $1.8 million budget had grown to nearly $4.3 million ($16.6 million in contemporary dollars) by the time May turned the film over to Paramount. She shot 1.4 million feet of film, almost three times as much as was shot for Gone with the Wind. By using three cameras that she sometimes left running for hours, May captured spontaneous interaction between Peter Falk and John Cassavetes. At one point, Cassavetes and Falk had both left the set and the cameras remained rolling for several minutes. A new camera operator said "Cut!" only to be immediately rebuked by May for usurping what is traditionally a director's command. He protested that the two actors had left the set. "Yes", replied May, "but they might come back". Angered by May's contentiousness during filming and editing, Paramount booked the completed film into theaters for a few days to satisfy contractual obligations, but did not give the film its full support. A new version of the film - approved by May - was shown at the Museum of Modern Art in New York City for the Directors Guild of America Fiftieth Anniversary Tribute on November 17, 1986.